There are four species of ‘possums’ in south western Australia, the Western Pygmy, the Honey, the Brushtail and Western Ringtail. All are marsupials, but despite their common names they are not particularly closely related to each other. 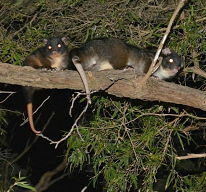 The much larger Brushtail and Western Ringtail possums are both found within the greater Torbay catchment. The Ringtail Possum is currently listed as vulnerable under the Commonwealth Environment Protection and Biodiversity Conservation Act 1999 (EPBC Act) and currently listed in Western Australia under the Wildlife Conservation Act 1950 under Schedule 1 species (‘fauna that is rare or likely to become extinct’), where it is also listed as vulnerable. The Western Ringtail Possum (Pseudocheirus occidentalis) has rapidly declined in abundance and range in the last 60 years. This is mainly because of habitat loss and predation by feral animals (they were hunted by humans for their fur right up to the 1950s). The south coast population is considered to be the ‘stronghold’ group as the two other populations are in decline due to pressures from urbanisation. Torbay Catchment Group is currently undertaking conservation efforts to manage threats, and improve habitat for the Ringtail Possum. Surveys for Western Ringtail Possums will be taking place through 2014 and 2015 and we are looking for members of the community to record any sightings. A survey form is available from the box above to record your sightings. If you would like to participate or have any sightings to report, please download a copy of the form or contact project officer Pip Tilbrook. Data collected will be supplied to the Department of Parks and Wildlife (DPaW) which will greatly assist them in their studies, as limited data are available to date from the Greater Torbay Catchment. Have you seen Ringtail Possums recently? One of the most important parts of this project involves collecting information from sightings in the greater Torbay catchment. Please download the Frequent sighting form (100Kb Excel) ready to enter your observations. Confined to the south western corner of Western Australia, populations are currently known from seven highly disjunctive coastal and inland locations. The highest density populations appear to be in the Bunbury/Busselton regions, Perup areas and around Albany, the latter occurring from the Greater Torbay Catchment (possibly further west but we are unsure of the boundary) in the west to Mt Manypeaks in the east, with an outlying population in the Porongurup National Park to the north west. The Western Ringtail Possum has a fairly small territory; usually about half a hectare (just over one acre). They mainly breed in winter, usually with just the one pouch young. Coastal forest, especially Peppermint tree (Agonis flexuosa) woodlands, is their preferred habitat. They shelter mainly in tree hollows in the canopy or they weave the leaves of a plant together and make a nest called a drey. The possum’s diet includes leaves, fruit, flowers, bark and sap of myrtaceous plants. Favoured food trees are the coastal Peppermint tree, which can provide the greatest part of their diet. They also like the flowers and leaves of the Jarrah and Marri. Sometimes they are found in household backyards if there are thick shrubs and desirable trees (or some juicy rose petals which they love!). An adult Ringtail Possum has a head and body length of 30 – 40 centimetres, a tail length of 30 – 40 centimetres and weighs between 0.8 and one kilograms. It has grey brown fur with lighter patches behind the ears and whitish underparts. It differs from the other large possums you see in our trees, the common brushtail possum, by being smaller in size, with slightly smaller ears; but the most distinctive difference is the tail. The Ringtail Possum has a long prehensile tail with a pink hairless strip on the underside and a white tip on the end which the brushtail has fur over the full length of the tail. For comparison, here are more details on the Brushtail Possum. 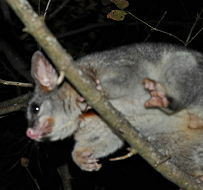 The Brushtail Possum is widely distributed throughout Australia including Tasmania, although its range has contracted away from the drier areas since European settlement. It was been introduced into New Zealand where it has pest status. Brushtail possums are typically silver-grey in colour, with a larger body and bigger ears than the Ringtail Possum. The tail is of a generally uniform colour and covered in fur along its full length. The diet of Brushtails can be quite varied, more so than the Ringtail – in addition to the leaves of many plants they eat buds, flowers and fruits, and even insects and worms. They live in tree hollows or any other place where they can stay dry and warm; in urban areas this often means that they favour the roof cavities of houses. The breeding season is generally in autumn and after being born in a very imature state, the young spend five months in the pouch. They then stay with the mother for several months more while they are still suckling, often clinging to her back when she moves around.